This badge was issued to Thomas Duerlund on 17 Aug 2018. This badge earner has demonstrated IBM Watson Campaign Automation (WCA) mid-level knowledge associated with Databases, Queries, Contact Lists, Mailings, Reporting, Organization Administration, Landing Pages, Relational Tables, Using FTP, Dynamic Content, External Content, and A/B Testing. They understand and can articulate terminology, concepts, principles, and needs related to WCA, and are also capable of applying this knowledge in a practical manner to support applicable client scenarios. Must be an IBM Client, IBM Business Partner employee or IBM employee. 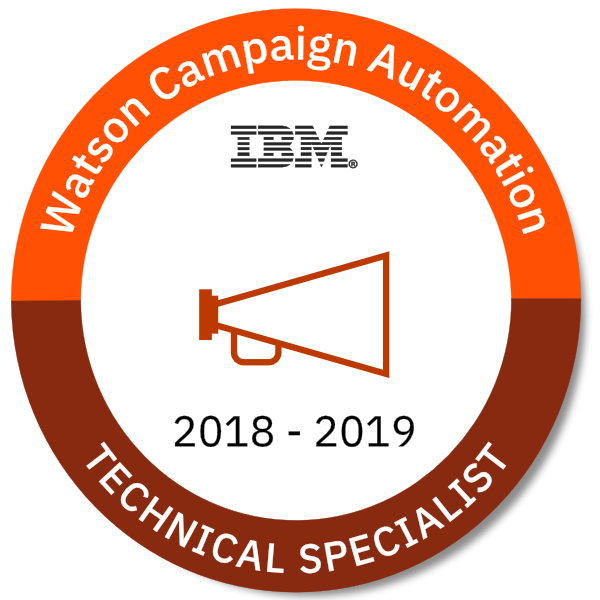 Complete the courses under the IBM Watson Campaign Automation 2018-2019 - Technical Specialist Badge Path. Successful completion of the badge course assessment with a passing grade of 80% or higher. Successful completion of the practical assessment with a passing grade of 90% or higher.